The third and final round of the 2018 NB Senior Men’s and Mid-Master Championship Presented by Audi Moncton began at 8:00am Wednesday morning with the Mid-Masters teeing off of hole #1 & #10. The first pairing of the day included Lawrence Justason of St. George, Mike Bourque of Moncton and Ken Barter of Petitcodiac off of hole #1. For a third consecutive round the players were faced to deal with strong wind conditions as they set out to put themselves in contention for the third and final round. 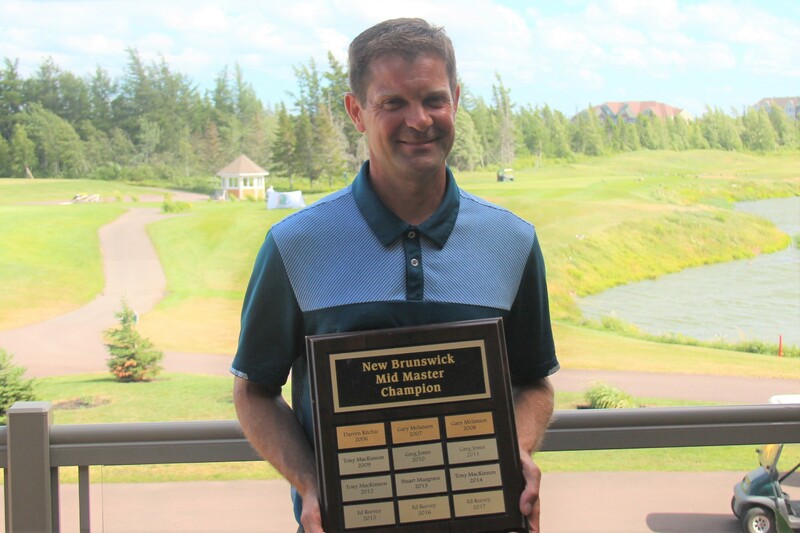 In the Mid-Master Division, it was 2015, 2016, & 2017 Champion Edward Reevey of The Riverside Country Club who through his dominant play in the links conditions of Royal Oaks would claim his fourth consecutive NB Men’s Mid-Master Championship. Reevey’s final round even-par 72 combined with a 1st round 71 and a 2nd round 73 provided a secure cushion at the top of the leaderboard at even par for the event, 10 strokes ahead of second place. Tied for second place was Edmundston’s Darren MacPherson and Lakeside’s Remi Comeau who both finished the event at 10 over par. The two moved on to a three-hole aggregate playoff to determine the alternate position for the Willingdon Cup Team, which MacPherson won to secure his spot in the field at the Canadian Mid-Amateur Championships in Victoria, BC. Finishing in fourth place at 11-over par is 2009, 2012 & 2014 NB Mid-Master Champion Tony MacKinnon of The Fredericton Golf Club. Edward Reevey of The Riverside Country Club will be joining the Willingdon Cup Team alongside Alex Palmer of The Riverside Country Club and Ryan Allaby of Hampton who will represent the province at the 2018 Canadian Men’s Mid-Amateur Championship, to be held from August 21 to 24, 2018 at the Victoria Golf Club in Victoria, British Columbia. 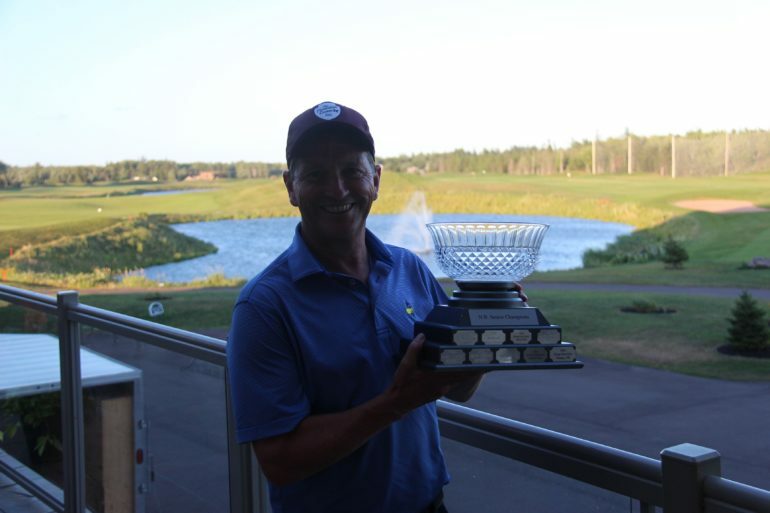 In the Senior Division, Eric Haley of Moncton responded with a 1-under par 71 during the final round to match his 3-under performance yesterday on route to claiming the 2018 NB Senior Men’s Championship Presented by Audi Moncton. Haley completed the event with a score of even-par after recording a 76, 69 & 71. Eric’s 71 was the low round of the day which consisted of 6 pars, 7 birdies, 4 bogeys and a double. Finishing in second place was Denis Beaulieu of St. Quentin who completed the event with a 4-over par 76 to finish at 6-over par. Rounding out the top three is The Riverside’s Mark Armstrong who finished 6 shots behind the leader and four back of Beaulieu. Mark Armstrong, Denis Beaulieu & Fernand Robichaud alongside the first alternate Mike Breen have been selected as Team NB members who will represent New Brunswick at the 2018 Canadian Senior Championships from September 4th-7th at Gowan Brae Golf & Country Club. This will be the fifth time that Gowan Brae has hosted a national championship event. In the past, it has hosted the Junior Girls National Championship twice, in 1992 & 2006, the Mid-Amateur National Championship in 1998, and the National Ladies Team Club Championship in 1996. For the second consecutive year, Herrick Hansen has captured the NB Men’s Super-Senior Championship after recording rounds of 75, 81 & 74 to finish at 11-over. The Aroostook Valley member was able to secure his victory after a final round 2-over par 74 to finish one ahead Country Meadow’s Guy MacKnight. Guy finished in second place at 15-over par after a 77, 78 & 76 performance at Royal Oaks where the players battled tough wind conditions all week. Claiming third place in the Super-Senior Division is Louis Boudreau of Pine Needles whose final round 3-over par 75 pushed him to 6-over for the event.